What do young people think of technology, economics and the role of business in the modern world? One recent global survey offers us a good idea. There were more than 26,000 responses to this year’s Shapers Survey , an annual poll by the World Economic Forum’s Global Shapers Community that gauges the values of people aged 18-35 and casts light on how they see the world today. The results can be divided into four key messages. 1. The first message is that people are optimistic about the future , even if they feel some concern about current events. 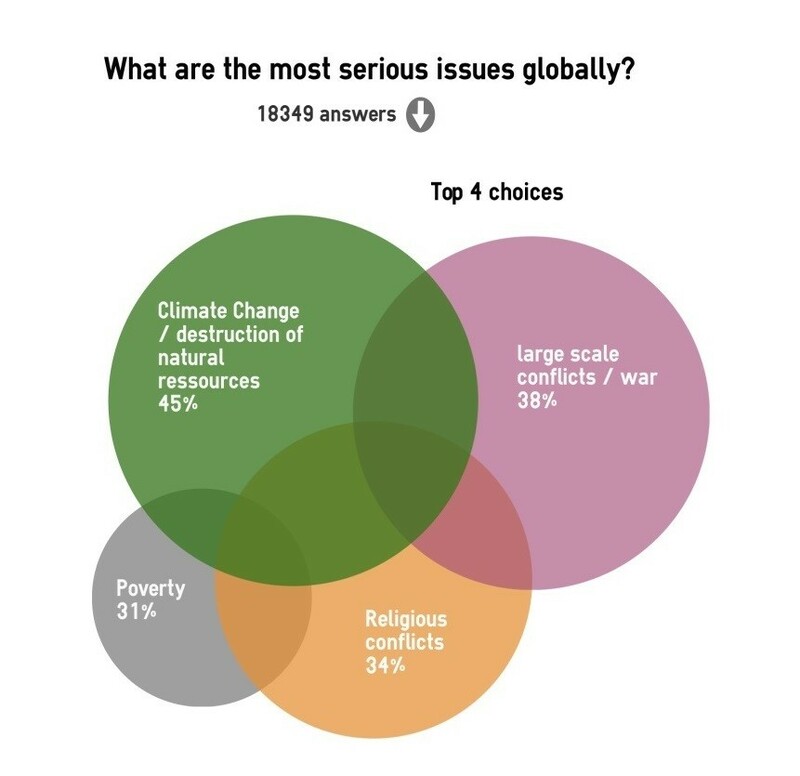 The most worrying of these events, according to the respondents, is climate change and the destruction of nature. This is followed by the threat of war and, in third place, religious conflict. 2. Perhaps it’s no surprise that young people have such worldwide concerns. When asked how they see themselves, most identified as “global citizens”. Their sense of shared destiny is message number two. It crops up in several findings; most pertinently of all, perhaps, in the youthful view of refugees. 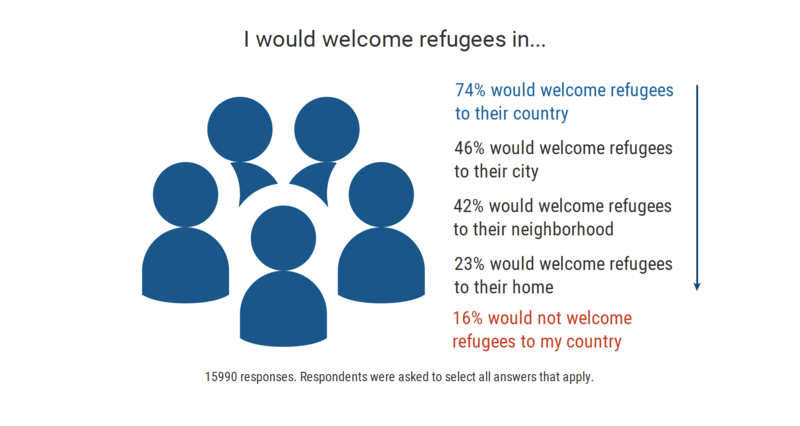 Young people around the world demonstrate great empathy for refugees, with 74% stating that they would welcome the newcomers to their countries and over 20% saying they’d welcome them into their homes. Young millennials in the United States lead the world in their empathy, with 89% saying that they would welcome refugees to their country. So how do young people view their countries’ policies on refugees? Most of the young people polled suggested that governments should integrate refugees into the workforce, with support for this approach at its highest in North America. 3. When asked about the top issue facing their country, millennials around the world selected the same answer, no matter their location: corruption. Young people have a desire for integrity, honesty and transparency that leaders in both public and private sectors can’t afford to ignore. When it comes to the list of expectations young people have of their managers and colleagues, integrity also comes top. 4. Message number four is that young people do embrace technology , with 86% of them believing that new technologies create jobs. But they are cautious: an overwhelming majority express concerns about online privacy, with more than 70% of respondents saying they have taken action to uninstall suspicious apps. Top technology trends are seen as artificial intelligence, machine learning and the internet of things; and millennials expect their lives to be affected by one or more of these, mainly in changes to their careers and education. They also expect that the top two industries to be transformed will be healthcare and education. Above all – and here we return to that first message of optimism – young people overwhelmingly believe that it is possible to create the future that they want. They may not trust world leaders and institutions, but over 70% of the millennials polled see the world as full of opportunities. Explore the findings and the report here: shaperssurvey.org . 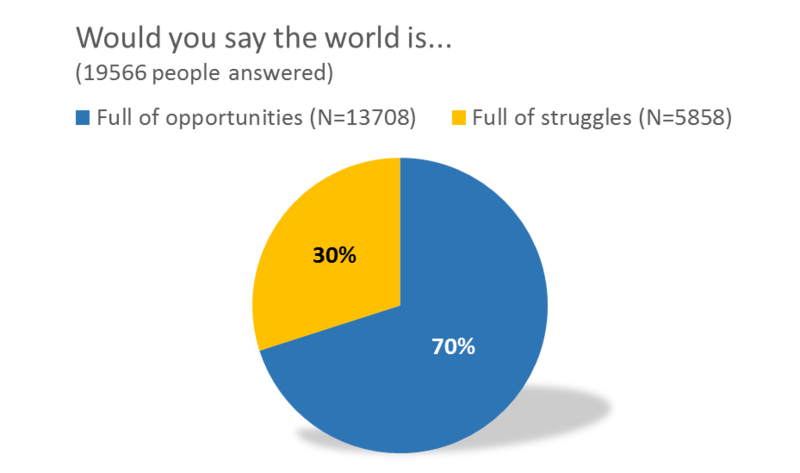 The Global Shapers Annual Survey ( #shaperssurvey ) received over 26,000 responses from 187 countries and territories. The survey polls 18 to 35 year olds on five dimensions: Economy & Global Outlook, Technology, Values, Governance and the Role of Business. The Global Shapers Community is an initiative of the World Economic Forum.